Ephesians 1:13 And you also were included in Christ when you heard the message of truth, the gospel of your salvation. When you believed, you were marked in him with a seal, the promised Holy Spirit, who is a deposit guaranteeing our inheritance until the redemption of those who are God’s possession—to the praise of his glory. I love sealed envelopes. Not just one that has been licked shut, but one with an actual wax seal on it. The seal shows the recipient that they are important to them, and says that what is inside is truly their words. When you believe that Jesus Christ died on the cross to take away your sins, your heart is then sealed, like a precious love letter. It is sealed so that all may know that your heart is God’s. That your heart is now given over to the truth of our salvation. When I was a kid, my mom drank a lot of diet soda. 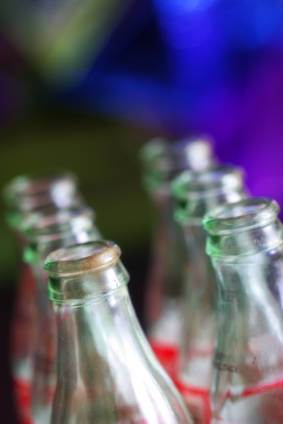 The soda generally came in glass bottles, six packs. We would buy a ton of six packs. We even had a bottle opener in our pantry attached to the wall to make it easier for us to open the sodas. Every time we went to the grocery store, we would load the car up with our empty bottles. That’s because we had paid a deposit on the bottles. When we brought the bottles back, we would put the bottles in a big bin with all the other bottles people had brought in. The cashier gave us a slip of paper that would get us back the money we gave as a deposit. When we believe in Jesus, we’re sealed with the Holy Spirit, and when we are returned, like soda bottles to the store, to God the Father (through our death or Jesus return), the presence of the seal of the Holy Spirit will ensure that we are given the inheritance that Jesus Christ won for us on the cross. We have been redeemed, bought back. He paid for it, and instead of keeping the rewards for Himself, Jesus shared his reward with us, that we might spend eternity with Him in Heaven. Praise God! We are given a guarantee that the deposit of the Holy Spirit will ensure that we are redeemed. If you believe in Jesus Christ as your Savior, the Lord has put the Holy Spirit in you as a pledge. He will never leave you nor forsake you. (Deuteronomy 31:6). Acting as a Seal, the Holy Spirit marks you as one redeemed by Jesus Christ. Imagine the devil and his minions seeing that seal and knowing their work is in vain. Do they stop trying? No, because they want nothing more than to pull you away from Christ. But the seal shows them their work is in vain. Believe and receive the Seal, the Holy Spirit.